“I’m a strong opponent of the death penalty because I feel it serves no purpose. It’s not a deterrent,” said Lawrence Watson, a Dorchester resident. Federal investigators say that Tsarnaev, 20, and his brother, Tamerlan, detonated two pressure cookers packed with explosives near the finish line of the Marathon on April 15. Three people were killed and more than 260 were injured, many seriously. Tamerlan died April 19 in a shootout with police in Watertown. The random telephone poll was conducted by the University of New Hampshire Survey Center for the Globe and included responses from 704 adults in Boston. The survey has a margin of error of plus or minus 3.7 percentage points. 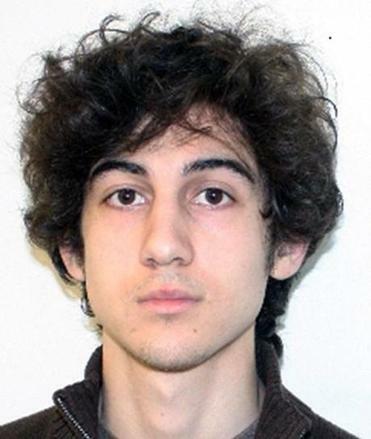 US Attorney General Eric Holder will decide whether to seek the death penalty in the case. Although a life sentence without parole received support in nearly all demographic categories, the penalty had more support from women than men — 64 percent and 50 percent respectively — and from older and more affluent Bostonians. Lawmakers in Massachusetts, which has not executed anyone since 1947, have repeatedly defeated efforts to reinstate the death penalty. In 1997, however, an attempt to reestablish capital punishment failed by a single vote in the emotional aftermath of the abduction and murder of Jeffrey Curley, a 10-year-old from Cambridge. 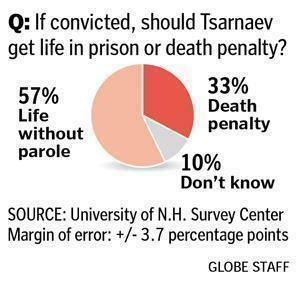 Still, some respondents favor the death penalty in the Marathon bombing case because of the indiscriminate violence that was unleashed. In other survey questions, Bostonians said by 53 to 37 percent that the US government can do more to prevent attacks such as the Marathon bombing. However, respondents told pollsters, by 43 to 36 percent, that they believed US intelligence agencies did not have information about the Tsarnaev brothers that could have prevented the bombings. In May, Boston Police Commissioner Edward F. Davis testified in Washington before the House Homeland Security Committee that federal agents did not tell local officials that they had investigated Tamerlan Tsarnaev until after the FBI identified his body. Tamerlan reportedly met with Muslim insurgents in 2012 in the restive Dagestan region of southern Russia. Boston Democrats, by 47 to 31 percent, said that federal intelligence agencies could not have stopped the bombing plot. Independents and Republicans were more open to the possibility that the blasts could have been prevented. Independents, by 49 to 32 percent, said the attack could have been stopped. Republicans narrowly supported that premise, 40 to 38 percent.